The dark side of Cassandra. Cassandra cluster is on production (along with pararell, old solution for this purpose). Phone rings at 2AM. C* cluster is down. Quick look at logs - OutOfMemoryException in random place in JVM. Outage time: 1h - let me just remind you “proven fault-tolerance”. Cluster restart, it works again. After few days… firing repair - the standard C* operation, which you have to run at least every gc_grace_seconds, by default 10 days. Usually it worked, but then, unexpectedly the server died and later again and again, related issue: “Unknown type 0” Stream failure on Repair. Outage time: stopped counting. Because of the failing servers in the cluster I decided to scale it out a little. Unfortunately, the issue above also made the scaling impossible. This means that for around one month at least few people could scale or repair their Cassandra clusters. I fully understand - it’s free and Open-Sourced-Software. However, even if something it’s free you expect it to work - that’s the harsh reality. If it doesn’t work just you look for something else. No offence Cassandra Datastax/Apache teams, you are doing truly amazing work, however in resilient software, stability is a TOP 1 requirement. Maybe it’s me? Maybe I’m the only one having problems? My friend working at a different company also told me, that they used Cassandra and they abandoned it. 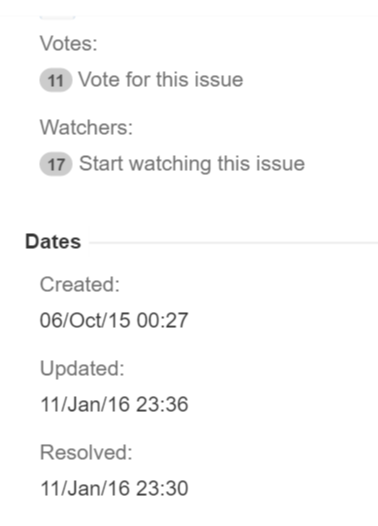 Just looked at linked issues and the number of watchers. In all cases the problems were similar to mine.